The 7 Best Bagel Shops in Wyoming! In Wyoming, you’ll find a culinary tradition of the East Coast: Delicious, boiled and baked bagels. From classic bagels with all varieties of cream cheese, to bagel breakfast sandwiches that will start your day off right, you’ll find everything you’ll need at these great bagel shops in Wyoming. The simple, green awning and brick storefront harken to the idyllic bagel shops of the East Coast. And they do their forebears proud: The bagels are chewy and perfectly golden-brown. Of particular interest is the variety of bagel flavors, many of which are only found here. Traditionalists have the plain with cream cheese, savory lovers have the classic everything bagel breakfast sandwich, with bacon and cheddar, and the veggie lovers have cheddar-dill and carrot cake. The Jackson Hole area is a competitive culinary region, held to the standards of its often demanding tourists and seasonal residents, and the unmatched majesty of the Sawtooth Mountains. But for over 20 years, Pearl Street has carved-out a food niche, producing some of the best bagels in the area. The bright red, wood paneled storefront merges the nostalgic corner-store with the yuppie-restored ski-town coffee shop. Their plethora of meats, veggies and condiments makes building a bagel sandwich the thing to do here: a pumpernickel bagel with smoked salmon and herb cream cheese is stellar. As is the case with Thai food, an otherwise boring, strip-mall style storefront is often a good sign for bagels (at least in Laramie). And past the entrance, over a dozen baskets of different types of bagels bombard the senses: smells of toasted seeds and caramelized onion, the green of spinach-parmesan, and a simple menu to build an excellent sandwich. The bagels here are New York through and through. At the Main, they take seriously the proven track record of traditional ingredients and old world technique. The morsels are properly boiled first, then baked to golden brown and chewy, served by friendly and passionate staff. Cranberry-orange and cherry-almond are some surprisingly breakfast standouts, slathered in blueberry cream cheese, while the lunch menu is equally satisfying, be it via the addition of roasted turkey or a full-blown reuben. The dining room here is certainly no frills, resembling an everyday rural diner or fast food restaurant. But this only means the energy is poured into the food. Since the early 90s, Big Apple has blossomed into a multi-state operation with the asset of making all items from scratch. The process is just as it should be: no shortcuts, pre-made or frozen items are utilized in bagel making. The classics are best here: the simplicity of a well-crafted sesame bagel, toasted, with butter, and an everything bagel cradling egg, cheddar and bacon. An onion bagel topped with roasted turkey, melted Swiss, rings of red onion and a bouffant of sprouts: it’s hard to pass up. 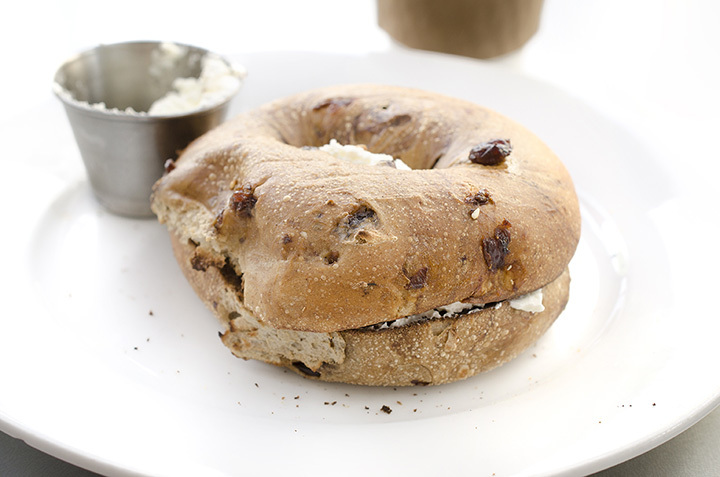 Especially when the bagels are baked fresh daily, and the ingredients are diverse, seasonal and regional. Frankly, given the handmade, additive-free deliciousness of theses bagels, the “Beyond” isn’t necessary. Twenty, yes, 20 varieties of bagels are available, all primed for toppings, meats, or a simple toasting. Obviously, this shop specializes in the sweet, similarly-holed cousin to the bagel. But, on occasion, and especially for the area, a toasted bagel here is a great appetizer for a warm, soft glazed donut.